Most associate President Herbert Hoover with the depression. That’s unfortunate. There’s so much more to learn from the man himself. Hoover once said, “Being a politician is a poor profession. Being a public servant is a noble one.” Let’s learn something about the noble Herbert Hoover. Herbert Hoover was driven by a sense of duty toward his fellow man having devoted much of his life to public service and humanitarian efforts. Here are just a few examples. In 1914 the future President, with the outbreak of World War 1, helped Americans stranded in Europe get back home. He chaired the Commission overseeing Relief in Belgium. President Wilson asked Hoover to be the Food Administrator during the war. On January 3, 1919, he was put in charge of European post-war relief efforts and directed the American Relief Administration which fed over 350 million people in the devastated countries which were facing starvation. Herbert Hoover didn’t cease his humanitarian efforts after his Presidency. In 1936 he became Chairman of the Boys’ Club of America and oversaw the creation of over 500 new clubs. With the outbreak of World War 2, Hoover helped raise funds for Polish, Finnish, and Belgian relief. After World War 2, President Truman asked Hoover to conduct World Famine surveys. The list goes on. What motivated Hoover? He wrote the following Message to the American Bible Society on Universal Bible Sunday on November 25, 1931. I am interested to know that December 6th is to be observed as Universal Bible Sunday. 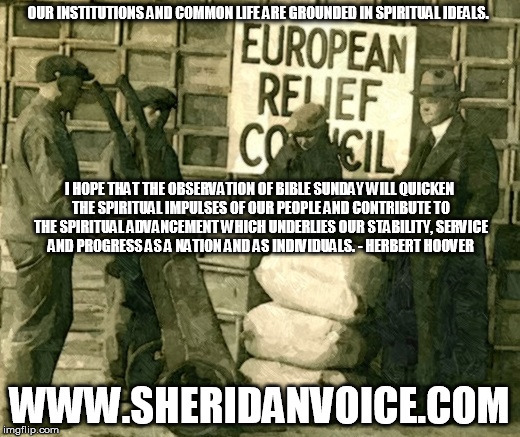 Our institutions and common life are grounded in spiritual ideals. I hope that the observation of Bible Sunday will quicken the spiritual impulses of our people and contribute to the spiritual advancement which underlies our stability, service and progress as a nation and as individuals.